Our freezer is jammed packed again, and I am grateful. Don’s hunting trip last weekend was a resounding success. He used a new rifle and was pleased to find it as accurate as “old trusty.” He landed two hogs and one doe. One hog was 100+ pounds and the other was small enough that it has been frozen whole for smoking one weekend with the neighbors who graciously invited Don to hunt on their property. Our thanks to their generosity as well. This was the first time we’ve ever been able to weigh our meat and know how much we really have, and to be able to portion the bags more accurately. We’ve been wanting a scale for ages but it was one of those things that because it was an added expense, it kept being pushed off in favor of essentials. We finally broke down and bought one at Walmart recently knowing hunting season was coming. It’s all of about $20 and we are laughing at ourselves a bit for waiting for so long. 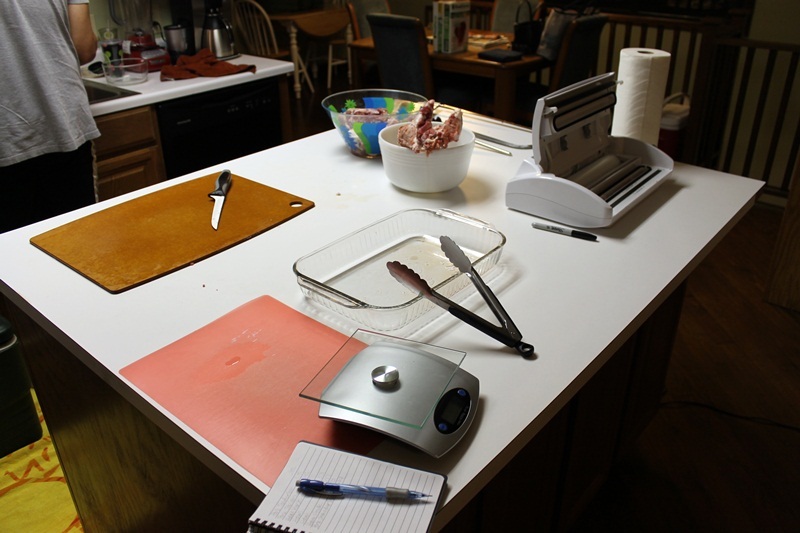 It has been so incredibly helpful in the kitchen, from weighing things for baking to weighing the meat as we went along. In previous years the meat processing has been tedious and difficult, but after a few years of trial and error, studying techniques online via YouTube, and obtaining tools to make the process easier, we have developed a system together that works well. Many hunters choose to have their meat processed for them; we save on that expense and do it ourselves. It’s messy work but we believe it’s an important part of the process of hunting and being self-reliant. We processed all 76 lbs over the course of two nights and about maybe four hours total. Our freezer is chock full of steaks, hams, roasts, and tons of packages marked for ground meat, sausage, and jerky! Yum. I know some people don’t value hunting, even view hunting negatively, but we do not hunt for sport or trophy. Don is a careful, responsible hunter who takes care to kill quickly and humanely. When possible, we prefer to eat wild animal that lived a life freely, free of confines, free of hormones, free of human manipulation. So we hunt for sustainability. (I say “we” even though it’s really Don. But I do value the skill of hunting, when done responsibility.) We believe that hunting is a skill that should not be forgotten or lost. None of us knows how our world might change in our lifetime and whether those skills might need to be called upon for survival someday. In my search for a quote relevant to hunting, or the skill of hunting, to include at the bottom of this post (which are nearly non-existent BTW, at least anything positive), I found a website dedicated to hunting with a page on the Virtues of Responsible Hunting, which we wholeheartedly agree with.